This roast beef is made in an original Japanese style by way of steaming, which slowly allows the flavors to blend, rather than oven roasting. The surface is crispy brown, and although the inside is freshly rose-colored, the flavor of the soy sauce and sake permeates right through to the center. In this was you can enjoy the pleasant chewy texture of Kumamoto Aka Ushi. 1) Put A in a pan and place over heat to boil. 2) Put beef in a very hot frying pan and brown the surface. Put the beef inside the pan in (1), cover the top with a paper towel instead of a drop lid, and place inside a steamer and steam for 10 minutes. 3) Remove the beef from the soup to cool. Let the soup cool as well. 4) Strain the soup, re-insert in the beef cooled in (3) and soak it overnight. 5) Remove the beef from the soup and cut it into slices about 0.2 in. (5-7mm) thick. 6) Boil the soup and evenly pour in starch with water while stirring to make gravy. 7) Blanche nanohana and plunge in water to cool. Drain the water and soak it in B. 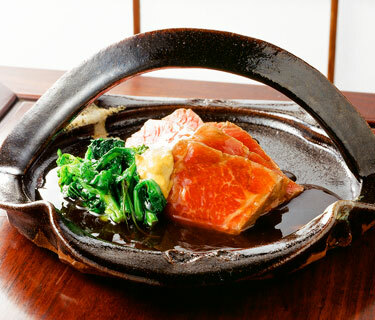 8) Place the roast beef and nanohana on a dish, pour gravy overtop the roast beef, and serve it with Japanese mustard. The Kumamoto Aka Ushi is raised in a relaxed, natural setting with abundant lush greenery and water. It is a high-quality beef with a bright color and gloss, a mild taste and adequate marbling. By way of a diet of abundant good pasture grass and a shortened fattening period, it succeeds in providing healthy meat without excessive fat. By covering the beef in the soup with a paper towel to steam, the flavor permeates through to the middle of the loaf.